Winner Poker offers players 24/7 tournament, cash game action, backed by the iPoker network, and is truly an international poker site. The poker room supports Euros, Pounds and Dollars in addition to currency specific games. Players who join Winner Poker will find a host of online tournaments geared towards land based events around Europe as well as guaranteed tournaments totalling more than $4 million each month. The poker room is part of the Winner.com network, licensed by the Government of Gibraltar and consists of an online casino, sports book and poker room. 250% up to $1000/£650/€700 First Deposit Bonus - Use Winner Poker bonus code TOPBONUS on Signup. 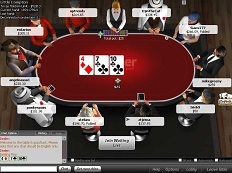 Through InternetPoker.com,all new players who join Winner Poker will receive a 250% up to $1000/£650/€700. This is the highest first deposit bonus available and is easy to clear. Players will need to earn frequent player points in real money games at a rate of 18 points for every dollar in tournament fees, and up to 27 points in cash games. As you accumulate these points, your bonus is into your player account in increments of $10 for every 1000 player points. Whether you are looking for real money or free poker games, Winner Poker packs it all. From Texas Hold'em to Omaha and Stud, the poker room hosts a variety of online tournaments and cash games 24/7. Thanks to the existing iPoker network, the poker room is able to maintain a high volume of players with traffic peaking in the European time zone. Game selection is available in Texas Hold'em, Omaha, Omaha Hi Lo, Seven Card Stud, Seven Card Stud Hi Lo, and Five Card Draw with stakes ranging from $0.01/$0.02 up to $25/$50. Tables support heads-up, six-max and full ring games all of which have a DP or NDP (no disconnection protection) available. Winner Poker tournaments are intense. Their weekend events, which highlight a Sunday $250,000 guarantee, are high trafficked. The poker room supports a unique leader board challenge for sit n go players, whereby the top players will win $100 free each day. In addition to this is the popular Jackpot S'n'G events which award up to $50K when you win a fixed number of game consecutively. 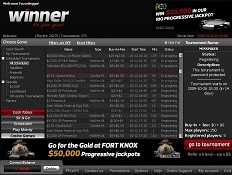 Winner Poker's software is multi-lingual, supporting French, German, English, Spanish and Russian. The software is only accessible in a download format and supports multiple currency options. In fact, players can choose to play in Euros, Dollars and Pounds and participate in currency specific games. The lobby provides some great features including a quick seat options, an advanced games filter, a drop down menu sorting cash games and tournaments along with the traditional in-lobby statistics. Players can access hand history files, and bonus information all within the My Account tab in addition to 24/7 customer support within the lobby. The tables are clean and support tournament stats, chat box, note taking, player tagging and dealer controls. Finally, the software supports some solid multi-table options with up to eight games in play simultaneously. The poker room supports a variety of payment processors including many of which allow you to fund your poker account using Euros or Pounds. Current deposit methods include; Visa, MasterCard, Bank Transfer, Pre-paid debit cards, Click2Pay, WebMoney, Ukash, PaySafeCard, NETeller, MoneyBookers, InstaDebit, iDeal, and EntroPay. Customer Support is available within the poker room software. Simply click the Live Chat button located in the main lobby and a live chat rep will be with you within a matter seconds. Alternatively, you use the toll free phone numbers located on the Winner Poker website. Please be advised there are country specific numbers depending on your residency, so it is best to check the website for the correct phone number. Finally yet importantly, you can also use the email method, although wait times are in the 1 - 3 hour range. Deposit $100 and receive $200 free. You need to use our Winner Poker bonus code TOPBONUS to receive up to $/€700 and the bonus must be cleared first.